A social enterprise differs itself from trading enterprises by the impact that it has on its beneficiaries and society. But what do we mean by social impact? 8.1 What is social impact? Social impact is the sum of the individual outcomes that are made by an organisation or service. Let us start with what a normal enterprise does. Inputs: These are all of the raw materials that are needed for the enterprise to produce something. So think of this like baking a cake. The more ingredients you have (inputs), the more baking that you do (processes), the more cakes you have (outputs). Outcomes: Outcomes are the things that have happened as a result of those outputs. In our cake example, as a result of a cake being baked, a children’s birthday party was complete and a child who had just turned five felt happy and full. Impact: Impact is the collective change of those outcomes. A family of a five year old and all of their friends had a great birthday party, feeling excited and happy and creating lasting memories. 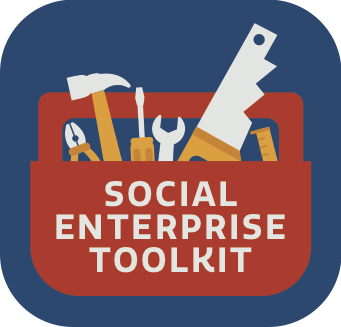 How are the lives of beneficiaries better as a result of the social enterprise? The process outlined above is called a Logic Model and is a way that we can help record our impact. Use the following table to measure your social impact. Identifying the problems – What is the need? Naming the desired results – What is the vision for the future? Developing the strategy for achieving the goals – How can the vision be achieved? You might have an idea on the types of outcomes and impact that your organisation has, but how do you know that you are achieving your impact? Measuring your impact can be a lengthy and arduous (if ultimately rewarding) process if you do not plan it correctly from the start. Our advice is to think about what you need to measure before you even begin and not to leave everything to the end. But what measures should you use? Focus Groups: Structured interviews with small groups using standardised questions and/or open discussion. You might want to think which method you might use when trying to guide your measurement. Any approach will determine what tools to choose or adapt. An instrument that has undergone a validation process to show it accurately measures what it was designed for, and to whom it was designed for. For example, controlled trials, academic studies, psychological instruments, etc. An instrument that is developed by an organisation for their own use, and to answer specific set of research questions. For example, questionnaires, surveys, tests, etc. We have already looked at what a Logic Model can do to help shape your outcomes and impact. Another step you can take is to look at a Theory of Change Model. This approach is more in depth and and requires more time and resources, however, it can help bring all stakeholders on a journey. To begin a Theory of Change Model, follow the steps below. Unlike other approaches, with a Theory of Change we want to start at the vision we would like to see. We take the distant goal and we work from there to where we are currently. When setting this end goal, try and use numbers and targets where possible. e.g. 30 people with learning difficulties will find employment within the next 18 months. A good way to think about this end goal is to imagine what the newspaper headline might read like after you have reached that goal. Be clear on who needs to be on the journey, who is affected by your organisation and who might have an interest in the organisation succeeding. Try and write them out and identify all parties. As we are starting at the end and work to where we are now, you will start to map backwards all of the changes that need to happen. e.g. for this to happen, what needs to happen before that. This will look much like a critical path in reverse. Don’t take anything for granted! Make sure you are being realistic and open with your assumptions. Try and find evidence for your position rather than from your hopes or beliefs. Read widely and don’t be afraid to change if a better solution is found. Now that you have started to identify the path that you should take, who is going to do what to make things happen. Put names and times and dates on your programme to begin to action the plan. Start to concisely phrase your theory of change. What are your inputs, processes, outputs, outcomes and impact as a result of your mapping? For example, by using the best staff with the resources you need, you can deliver a service, that service can help a specific number of people with a particular need and those people are changed as a result of your service. Once you have thought about your outcomes, you can start to identify short, medium and long term outcomes. It would be helpful to use time periods as a way to easier identify the impact your organisation will have. An organisation that trains ex-offenders and helps them get jobs makes them less likely to re-offend. One of the difficulties of measuring the Social Return on Investment is that many of your results cannot be definitively proven. For example, if you are saying you are reducing the recidivism rate by working with ex-offenders, how much of that work is down to you or other factors? Is it because of your work with them or because it would not have happened anyway? It is important to be factual and as accurate as you can be about your claims. In the instance of ex-prisoners going on to offend, if you state that every success is down to you, you are ignoring the statistics on those ex-prisoners who did not go on to reoffend despite never having met your organisation. put a € value on the impact of the social enterprise: commonly used to demonstrate to a funder the return on investment that has been achieved. This enables funders to see that their investment has made a measurable difference. That makes it easier to justify continuing the project. estimate the financial value of what is planned: used to support funding bids. It strengthens your case if, for example, you can show that by giving you €50,000 you can save your funder €150,000. This is important if you are bidding competitively for funds or applying for a grant. Beneficiaries – who are the people you work with and what defines their needs in the eyes of funders? Making a difference – what is it that you do that changes attitudes, behaviours, aspirations and abilities? What happens if you do nothing? – in other words, what would this group do if you were not engaging them in some way? What are the additional benefits of what you do? – although you set out to change one thing, others might also improve. What are they and what’s their value? How does the money you’re asking for relate to the money you think you’ll save? This ratio is the SROI. Involve the people you expect will see savings and/or fund you in doing the calculation. If they work out the sums, they will have more faith in them. Include the most important savings and avoid the temptation to make claims that others will consider too bold. Appreciate the full breadth of the impact you might have and don’t simply focus on the first thing you think of. Share all of your findings, even if some contradict the argument you are trying to make. Total transparency will win you friends. Benchmark your calculations against what actually happens with your project and others. Include anecdotal evidence and client case studies to make it real. The Social Return on Investment methodology was created primarily as a tool to help charities and social enterprises show the financial impact of their work. But, many companies are now starting to use the same calculations to show that a commercial company can have a return. A lot of commercial companies are starting to show their impact by having social enterprise products and services in their supply chain. If an organisation can show that they are helping more direct beneficiaries in their normal work, it can go a long way in attracting more customers to their products and services. For example, retailers are teaming up with social enterprises to deliver food waste directly to homeless charities. Instead of dumping the food, the food can be repurposed to work with charities that can put them to use. As a result of your social impact measurement, theory of change and your new found knowledge on social return on investment, you might find a new world opening to social enterprises. With the gradual pick up of ‘community benefit clauses’ in government contracts, social enterprises could have found a unique opportunity to making sure that your SROI is up to date. While there are many projects that could benefit from these clauses, there are already opportunities opening up. Social enterprises that are measuring their social impact could compete with other for profit trading companies for some lucrative work.